As you walk into the ARHS building, your eyes are drawn to the big wooden doors in front of the auditorium, adorned with pictures of dancers. As you pull the door open, you instantly feel entranced by the twinkly lights and the paintings on the walls. You see pictures of familiar faces and a smile as bright as the moon. You walk around the floor and get a feel for the masterpieces that have been created there, feeling the passion that will soon come through you. Take a look at all that you are, and what you can become in the mirror straight ahead of you. The moment you look away though is when you are able to step out of your physical appearance and into your soulful being. You learn to express yourself for the person that you are, not who others make you out to be. 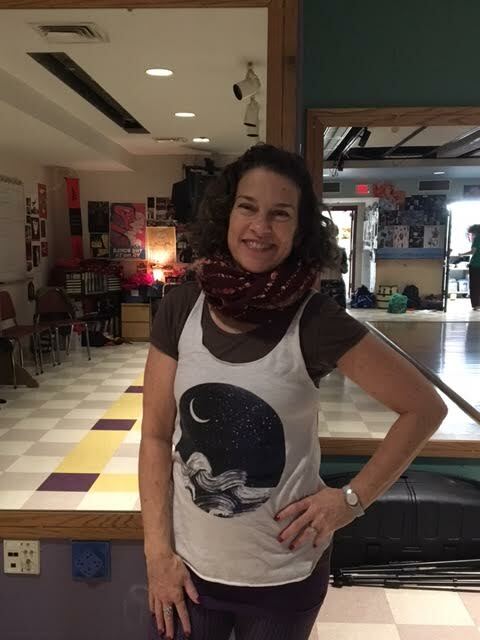 Ms. Vernon has been teaching dance at ARHS for 15 years. She initiated creation of a dance studio in 2004 and not long after that, began to build her classroom. When she first started working here, dance was an elective for opting out of gym class. During P.E., Tracy would teach students who did not feel comfortable in gym. They not only got credit, but learned that they have talent and they can use dance to be free. “People found out they were dancers by experiencing it,” Ms. Vernon said. She said that she brings a love for teaching and a desire to encourage and accept everyone she meets. She said, ‘I am qualified to teach K-12 but I feel as though teenagers are the future,” so she remains at the high school. Ms. Vernon cited her love for “the integrity or tenacity” of the students here, whom she sees getting actively involved in all kinds of things that exist beyond their own bubble, for a greater good. She also said that in order to connect with students, she learns about them and helps them succeed in any way possible. The students who have taken classes in the dance studio are not only in love with the art form, they are also in love with everything the dance studio offers them. “The dance studio is such a nice community and I’ve met a lot of my close friends in the dance classes,” senior Maha Awaisi said. Sophomore Negar Farahbakhsh said, “It’s a place where you can let go of problems during the day and just be.” Tracy’s classes incorporate social justice and they introduce a sense of belonging to people who may not have any other outlet. To a student who has never taken a dance class, it may seem like just another elective, but the students that have experienced all that takes place there have something different to say. “I love the welcoming environment. It is like a family, so it’s like a home in a lot of ways. You are not judged for being who you are, or who you think you might be. You are treated as you want to be treated,” said senior Meghan Cave. Students who have taken the class have fallen in love with the self-expression aspect. “Dance for me has always been a source of creativity, a great way to de-stress, and a way to express myself,” said Awaisi. The students who are enrolled in dance classes here love the dance studio, but if there was anything they could change about it, it would be the dance floor. Ms. Vernon teaches four dance classes: World of Dance, Intro to Dance, ‘DTE’ or Dance Theatre Ensemble and Conjunto de Bomba. The classes are centered around differences, acceptance, empowerment and social change.